Raith Rovers were still top of the league on Tuesday night, but defeat at Forfar left them feeling rock bottom. Rovers travelled to Station Park looking for a reaction to Saturday’s dismal performance in Ayr, but another abject display resulted in a second successive loss. The defeats have handed Ayr the initiative in the League One title race, with the Honest Men now top on goal difference, and with a game in hand, after a 1-1 draw at Arbroath on Wednesday night. Just a few weeks ago Rovers looked to have taken a strong grip on the championship race, but just two points collected from the past four games has left them hoping for Ayr slip-ups. Ashen-faced Barry Smith spoke to the Press after a long dressing room lock-in at full-time on Tuesday, and the manager could not hide his anger and frustration. “It was certainly not the reaction we were looking for,” he said. “The first half was okay, but the second half wasn’t good enough – again. “We’re getting let down, badly, because we’ve got experience at the back and we didn’t defend properly, and we never got a lot going forward either. There now appears a lack of confidence among the Rovers ranks but Smith insists his players will only get that back through hard graft. “The only way you get confidence is by working hard, and making sure we try to do the right things,” Smith said. “They’ll always work hard, but we didn’t do the right things. Raith are also suffering from a lack of experience in the middle with first choice midfielders Scott Robertson and John Herron absent through injury. “Scott’s been a massive miss for us, just his experience in the middle of the park, and you can see that since he’s went out the team,” Smith said. 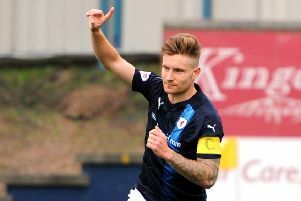 Raith now need to pick themselves up for a Fife derby this weekend, with the home game against rivals East Fife being moved to Sunday at 4.10 p.m due to live BBC Alba coverage. “The aim at the start of the season was to get promotion and we’re still in the hunt for that,” Smith said.